I have always looked forward to celebrating the holidays with my family and friends. After my wife Heather gave birth to our daughter Lily in August of 2005, I looked forward to the holidays even more. I knew we would be able to start our very own holiday traditions with our new addition. 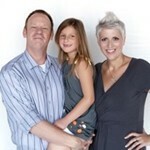 However, Heather’s cancer diagnosis that year made all of our holiday plans come to a screeching halt. It was three days before Thanksgiving when Heather received her diagnosis. Sadly, she had been diagnosed with malignant pleural mesothelioma, a rare and deadly form of cancer. In one ordinary afternoon, all of our plans changed. I was really angry, and could not stop imagining the worst possible outcomes from this situation. Even though I hoped for the best, I knew that the future did not look positive. We still decided to celebrate Thanksgiving that year. We celebrated the holidays with Heather’s family, for we knew that we would soon begin the treatment processes in Boston. After eating our holiday meal, we sat and discussed the things that had to take place during this difficult time. I was not looking forward to this conversation; as a matter of fact, I had been dreading it for days. We discussed many things that I knew were inevitable, but hoped we wouldn’t have to discuss. These included our finances, assets, debts, and Lily’s childcare. I had to listen to Heather’s family talk to us about which bills they would help us to pay. Heather and I both had jobs before Lily was born; however, we were now living just on my income, and the unexpected expenses that come with cancer treatment were threatening to ruin us financially. I felt embarrassed and ashamed throughout the whole conversation, and it would be years before I could look back on that day with anything but shame. At the dinner table, I truly did not realize all that I had. It took many years for me to realize how much I should have appreciated my family. My family members were willing to help us in any way that they possibly could, and my pride had not allowed me to see this. Looking back, though, I can see how truly blessed I am to have such amazing people in my life. This holiday season, I want to show my appreciation for my family and friends, who helped us in so many ways through this difficult time. Also, I pause to remember how thankful I am for Lily. All of these people are the reason why I look forward to celebrating the holidays. After seven years, Heather is still here, and after months of treatment she has beaten mesothelioma, despite the overwhelming odds. Moreover, we have celebrated seven Christmas holidays with Lily and are looking forward to celebrating many more. We hope that our story can be a source of hope and inspiration to all those battling cancer this holiday season. Above is a blog by a friend who has visited my blog articles regarding my experience with winning the fight with prostate cancer. Cameron’s wife along with him and his family have been victorious fighting a different type of cancer. Please visit his web-sites and support his cause.